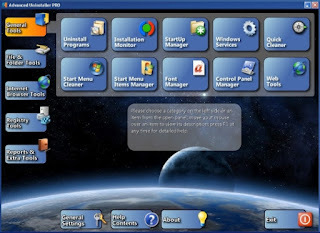 Advanced Uninstaller PRO uninstalls programs quickly and completely using its simple, fast and clear interface. Easy to read information and help is readily available throughout the program, guiding you every step of the way. This program helps your PC run at its full speed by taking good care of the registry and services. It also helps you free disk space by detecting and removing duplicate files and helping you turn on Windows file compression if needed. The Installation Monitor can watch all the actions that a program performs on your computer while it installs. What's new in this version: Version 10.62 has improved browser history scan compatibility and fixed a few minor bugs.